Lynn, June 10, 2016 – The Haven Project is one of 100 local nonprofits to receive grants of $100,000 each through Cummings Foundation’s “$100K for 100” program. The Lynn-based organization was chosen from a total of 479 applicants, during a competitive review process. The Haven Project is dedicated to serving the growing yet marginalized population of homeless and unaccompanied young adults on the Northshore. It provides much needed support thorough its drop in center located in downtown Lynn, which offers services surrounding issues of employment, education, housing, basic needs, and community support. Representing the Haven Project, Gini Mazman, Executive Director and Founder joined approximately 300 other guests at a June 9 reception at TradeCenter 128 in Woburn to celebrate the $10 million infusion into Greater Boston’s nonprofit sector. 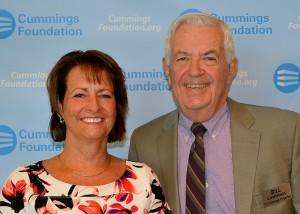 With the conclusion of this grant cycle, Cummings Foundation has now awarded more than $140 million to local nonprofits alone.